New York is a paradise for people who love to eat. It’s rich in agriculture, artisan foods, craft beverages, and tasty culinary inventions. In fact, New Yorkers turn eating into an art form by creating experiences that engage all the senses. Here, we&apos;ve gathered restaurants and foods that don’t just offer a meal—they offer an adventure to be remembered and savored for years to come. 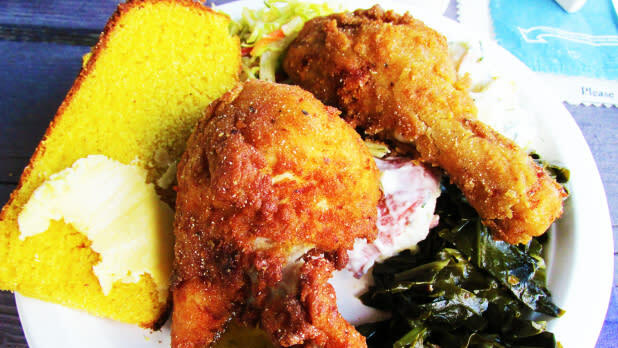 Read on to see where to go for food that always tastes better in New York. Thanks to the new Japanese restaurant Zauo, which opened in 2018, diners in New York City can try some of the freshest seafood they’ll ever taste—by catching it themselves! First of all, the decor is stunning. 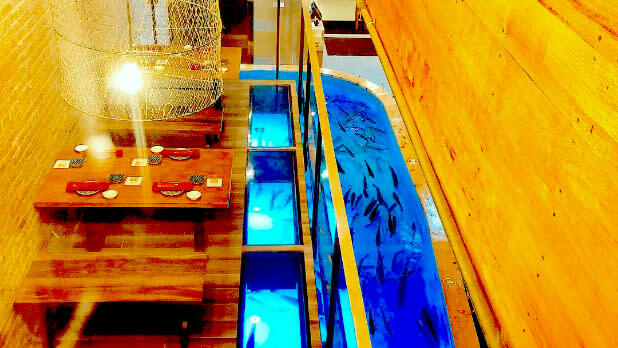 The first thing you’ll notice upon entering is the hull of a massive wooden boat hanging from the ceiling. Then you’ll probably notice the several bright blue tanks of water filled with striped bass, fluke, flounder, and rainbow trout, which you get to fish for yourself! The staff is ready and waiting to help you with your catch if you need it, and will celebrate by beating on Japanese drums when you succeed. Then, you get to choose how you want it prepared, grilled, tempura, or simmered in soy sauce. There&apos;s also a separate dinner menu if you&apos;d like to let someone else do the hard work. It’s a ton of fun and can’t possibly get any fresher. 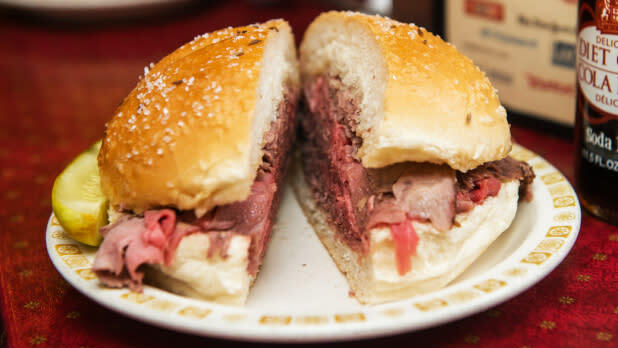 In the mid-19th century, a German immigrant in Buffalo invented the Beef on Weck sandwich—thin-cut roast beef on a kimmelweck roll (hence the name) baked with caraway seeds and salt. The sandwich comes spread with horseradish, with the top bun, or entire sandwich, meant to be dipped in au jus from the roast. It’s a salty, juicy, ultra-flavorful treat that sandwich purists travel to eat at several authentic Buffalo mainstays including Schwabl&apos;s, where you can watch as the beef is carved for your sandwich right before your eyes. The Genesee Brew House in Rochester has become a serious beer connoisseur&apos;s destination, with interactive exhibits, special events, and a gift shop. Of course, there are free tours of one of the oldest continually operational breweries in the country, complete with a tasting of four samples of fresh-brewed beer for just $4, the proceeds of which are donated to local charities. The 9,200-square-foot building also features a rooftop restaurant overlooking the city’s famous and beautiful High Falls and Genesee River Gorge. But should you want the complete Rochester drinking and dining experience, head to Nick Tahou Hots, the restaurant credited with inventing the Garbage Plate when it opened back in 1918. What&apos;s on it? 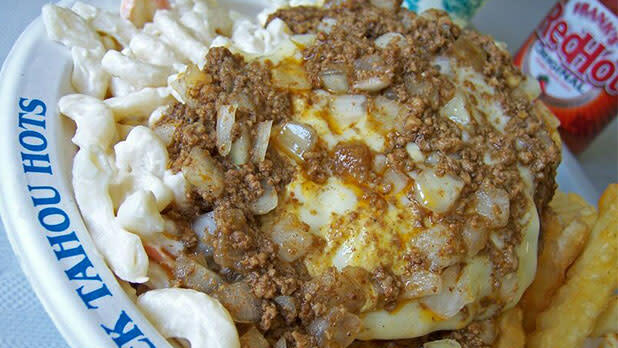 A pile of home fries, macaroni salad, two cheeseburgers, Dijon sauce, onion, and spicy chili—all on one humongous plate. Speaking of New York natives, you’ll be amazed at how speedily you fall in love with spiedie sandwiches (sorry/not sorry). 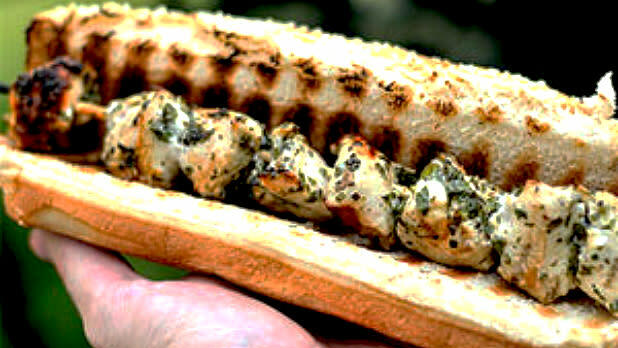 Spiedie sandwiches are comprised of tender cubes of meat, marinated overnight and grilled on a skewer over a charcoal pit, then slid onto soft Italian bread. Italian immigrants in Binghamton dreamed up the unusual sandwich in the 1920s, originally with lamb; today, you can find chicken and beef versions too. Visit one of the city’s best known spiedie spots to try it, such as Lupo&apos;s S&S Charpit, which has been serving the sandwiches since 1951, or the Spiedie & Rib Pit, where you can find unusual takes on the classic, like Buffalo chicken, gyro-style, and one that’s smothered in melted cheese. The Spiedie & Rib Pit also sells its own bottled spiedie sauce if you want to try cooking one up at home! For the complete Binghamton experience, attend the annual Spiedie Fest and Balloon Rally in August, a massive festival with enormous hot air balloons, spiedie sandwiches, arts and crafts, sports, and more. You haven’t done oysters right until you’ve tried shucking them yourself. Head to the Little Creek Oyster Farm & Market, a beloved bait and tackle shop-turned restaurant on Long Island’s historic Greenport waterfront. 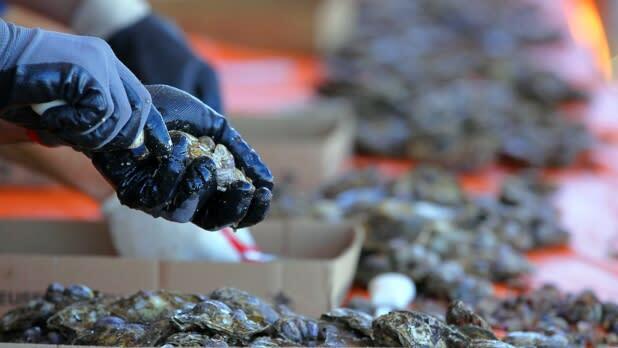 If you’ve never shucked an oyster before, not to worry! The staff is super friendly and happy to show you the tricky technique—while making sure you don’t cut yourself! Little Creek offers a variety of oysters from all over Long Island, and its menu even notes the name of the farmer who provides each kind, so it’s endearingly apparent how much care goes into serving this delicacy. 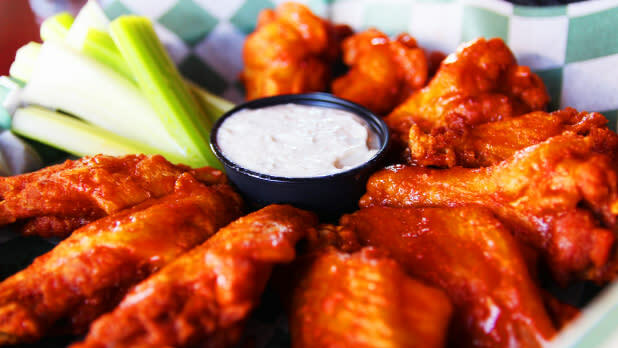 Enjoy them with a selection from a lengthy list of craft beers, including many local options. Have you ever felt FOMO over food? Wondered about all the hidden gems you were missing? Well, one amazing thing about New York State is its Taste NY initiative, which helps bring the best of New York’s local foods and beverages into the spotlight, in large part with its Taste NY Culinary Trails. Each trail maps out an itinerary of farms, orchards, distilleries, creameries, bakeries, and more. And as of October 2018, six brand new trails have been added: the North Country Trail, the Adirondack Lakes Trail, the Boquet Valley Trail, the Champlain Valley Trail, Champ&apos;s Trail, and the Ausable Valley Trail. The Ausable Valley Trail, for example, takes you from a family farm to a mountainside cafe, two coffee shops, four breweries, a creamery, and more. Check the Taste NY website to see specific vendors on each trail and get to tasting! Move over, pizza and beer. Slightly sweet, slightly tart, fresh-pressed apple cider and brick-fired thin-crust pizza are a winning combo and available to savor outdoors at the stunning Westwind Orchard. The owners, married couple Laura Ferrara, a stylist, and Fabio Chizzola, a fashion photographer, both come from Italian families and grew up with fresh pizza baked outdoors in the Old Country, so they wanted to recreate the experience. Ingredients and toppings are fresh from the farm, such as apple blossoms, potatoes, and homemade mozzarella. 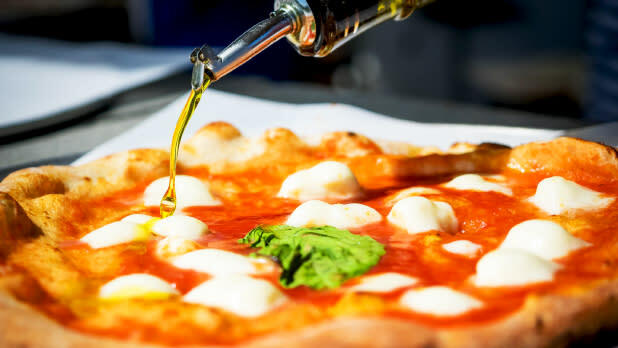 The gorgeous grounds provide the ideal backdrop to sipping a variety of ciders and enjoying pizza good enough to draw urbanites two hours out of the city just for a bite. Plus, the couple sells fresh-from-the-farm products including cider and jams at Westwind Orchard’s tasting room (call ahead to make sure they’re open, and note that it’s closed in winter). Some people eat to live and others live to eat, right? Serious culinarians even plan their entire vacation solely around food, like those heading to the Debruce Lodge in the Catskills! 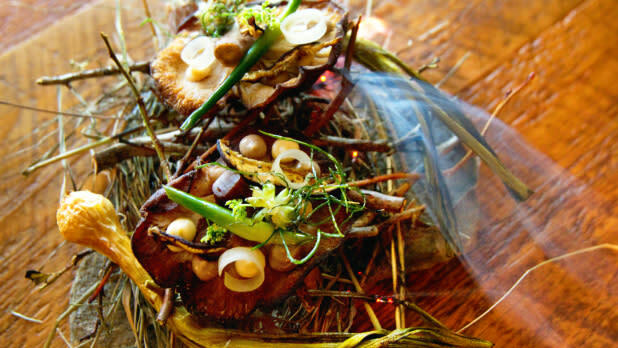 Tucked in between Willowemoc Creek and forest, this weekend retreat is where Executive Chef Aksel Theilkuhl offers a culinary journey that’s becoming less under-the-radar by the day. You’re eased in with a casual dinner on Friday, but the main event is a nine-course tasting menu on Saturday. 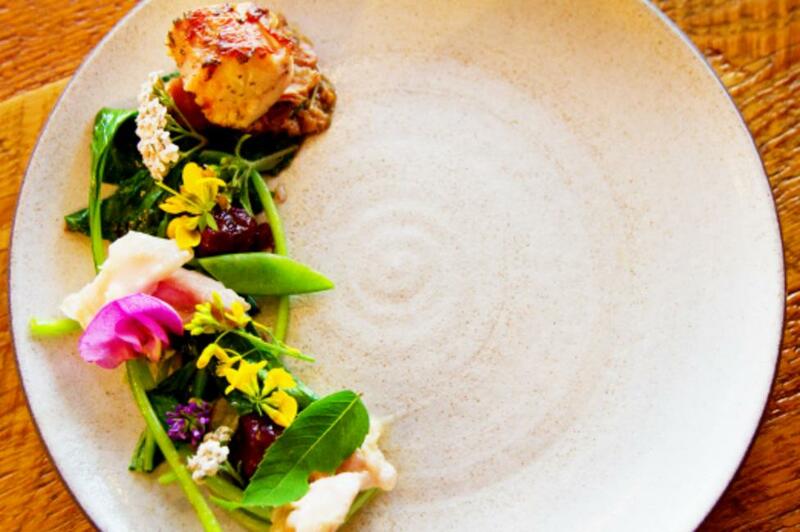 All dishes highlight ingredients foraged on the surrounding grounds and gathered from neighboring farms. Don’t take our word for it: Condé Nast Traveler recognized it as one of the world’s best hotels, and Esquire named it one of the best restaurants in America in 2018. If you don’t want to spend the night, outside guests are welcome with a reservation 24 hours in advance. Take a time out from TV and phone-checking at dinner and escape to a bucolic sanctuary where you can appreciate good food and good company. 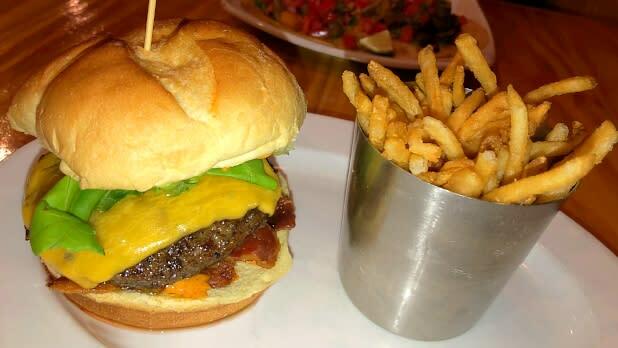 The food did not travel far from Heather Ridge Farm to the tables in its Bees Knees Cafe. The dishes include a farm skillet, chestnut soup made with Schoharie County chestnuts, and “Oink and Moo Chili” (beef and chorizo). The farm’s chef, Rob Handel, offers cooking classes and workshops if you find yourself inspired to become a homesteader. Walking tours of the farm are available for just $5 for adults (kids are free) during the summer and fall. You can see all the animals, collect eggs, and learn about the techniques and technology of modern farming. Swing by the farm store on your way out to shop farm products like freshly made sausage, cheeses, yogurts, and more. Hold all judgment, because, despite its quirky name, you’re going to want to get in on River Rat Cheese Curds. First things first, why “River Rat”? Because their famous cheese curds squeak between your teeth when you eat them! And they’re located a block away from the beautiful St. Lawrence River; it’s a short walk to the Antique Boat Museum. While you’re at River Rat, be sure to sample its also-famed cheddar-horseradish spread, as well as cheddars of various ages, even up to 14 years old! (Young kids will get a kick out of eating cheese that’s older than they are.) The store also sells sausages, maple treats, honey, jams, coffee, and all kinds of other gourmet eats, so it’s the perfect place to stock up on picnic items before enjoying your meal by the water. As New York is the second-largest producer of maple syrup in the country, you absolutely cannot pass up a chance to try fresh-made maple products at a local farm. 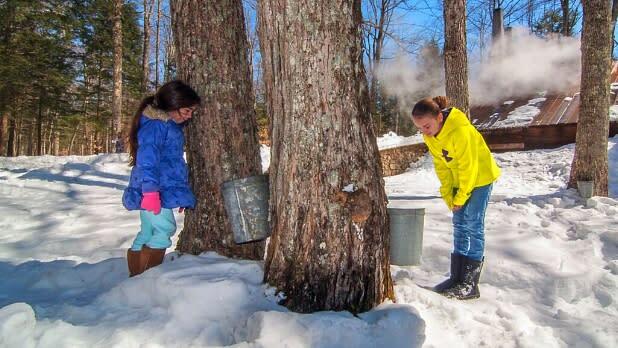 The folks at Sprague&apos;s Maple Farms will take you to their old-fashioned sugarhouse to show you the process of tapping trees and share ancient methods of making syrup. Taste the final product in the form of maple cotton candy, maple Chardonnay, and of course, classic syrup poured generously over a fresh stack of pancakes. Grab some maple products from the farm shop for gifts and tasty souvenirs. Sprague&apos;s Maple Farms are open all year, but if you can, swing by in March or early April when it’s maple-sugaring season and farms all over the state open their doors to teach the public about the sweet stuff!